* Part of Braves Field remains intact to this very day, as part of "Nickerson Field." The compass orientation of center field shifted in 1928, and in other years as well. BEEN THERE (too late): I visited what is now called "Nickerson Field" on Sept. 5, 2016, and had a fleeting glimpse from a train in August 1998. Braves Field was the last of the early 20th-Century "classical era" ballparks, i.e., those built prior to World War I, but it was also the first one of that era to be closed down. Like Fenway Park, located less than a mile away, it only had a single deck, but it was truly mammoth in proportions, giving Braves Field the biggest seating capacity of any baseball stadium until Yankee Stadium was built eight years later. There was a very large roof that covered most of the main grandstand, and along both foul lines there was an uncovered "pavilion." A small bleacher section in right field came to be known as the "jury box" because one day there were only twelve fans sitting out there. Unlike Fenway Park, the original field dimensions were enormous, 402 feet to the left field corner and 440 feet to center field. The deep corner in far right center field was about 520 feet from home plate, but that area (which had a slope in front of the perimeter wall) was often fenced off, as standing room for patrons. The field was designed this way because the team's owner favored base-running-intensive games with lots of triples and the occasional inside-the-park home run. During the 1920s, as Babe Ruth's torrent of home runs changed the very nature of baseball, fans began demanding more of this new kind of bicep-powered action. So, in 1928 the Braves added new bleacher sections in left field and center field, drastically reducing the dimensions on those sides. In addition, they turned the diamond a few degrees clockwise, resulting in a very short distance to the right field foul pole. Those changes caused too many home runs, however, so they soon moved the new left field bleachers toward the rear during mid-season. (They may have been rotated, pivoting on the corner near the center field bleachers, which may or may not have moved.) This was awkward, because it took a while before the concrete foundations of those bleachers could be removed. In almost every year from the late 1920s until the early 1940s, the outfield dimensions changed, but much uncertainty remains over the exact sequence of these changes. For example, according to Lowry's Green Cathedrals (2006), the center field distance was reduced from 461 to 387 feet at the beginning of the 1928 season, and then raised to 417 feet as of July 1928, when the bleachers were moved back, and then reduced to 387 again the next year. Or maybe not! Some of these oscillations may have been nothing more than remeasurements or merely spurious figures. A video of Babe Ruth playing for the Braves in 1935 shows a distance marker of 387 in the corner, about 30 feet to the left of true center field. Another piece of hard evidence: a 1937 photograph shows that there were distance markers of 404 feet at the end of the "jury box" bleachers, and 407 feet about 50 feet to the left of the right-center field corner. It also shows that the backstop distance was very short, probably about 45 feet. From 1936 to 1941 the Braves were called the "Bees," and their stadium was renamed accordingly. In 1937 a triangular section was blasted out of the right field pavilion to bring the distance to the right field corner up to a very respectable 376 feet. In the early 1940s this distance was reduced when a bullpen was installed in front of the "jury box," eventually ending up at about 320 feet. Meanwhile, the bleachers in left and center field were removed, and a tall new wooden fence was built, gradually curving between the power alleys, and ranging in height from 20 to 25 feet. The center field distance apparently shrank to a mere 370 feet in 1943, then rose again, and seems to have settled down at 390 feet by the end of the decade. (The marker was just to the right of center field.) In 1946 lights were installed, one of the latter stadiums in which that was done. Ironically, those lights were only in use for seven years before the Braves left Boston. At some point in the late 1940s (1948? ), three rows of box seats were added in front of the grandstand beyond the two dugouts, and in front of both pavilions. One of the problems with Braves Field was that there was usually a strong wind blowing in from center field, making it very hard to hit the ball very far. This resulted from the fact that the stadium was situated rather close to the Charles River, which was a sort of funnel for ocean breezes. (It reminds you of Candlestick Park.) The stadium was also right next to a major railroad switching yard, with the tracks paralleling the left field outer wall. The smoke from the locomotives often clouded the field, so they planted a row of fir trees to block this unsightliness, to little avail. On the plus side, Braves Field was easy to get to, with trolleys stopping right in back of the stadium. This vast, wide-open stadium design with a very shallow incline left many fans far from the action and seemed better suited for football games. There was no other baseball stadium like it. There were no more World Series games in Braves Field until 1948, when the Cleveland Indians beat the Braves in the first-ever all-Native American mascot World Series. (The Braves got their revenge when the two teams had a "rematch" in 1995.) If the Red Sox had not lost to the Cleveland Indians in a tie-breaking American League pennant playoff game in 1948, it would have been the first and only all-Boston World Series. For many years the Braves' attendance figures dwindled, especially during the 1940s when Ted Williams drew the attention of virtually all Bostonians to the Red Sox. That was too bad for the Braves' future Hall of Fame pitcher Warren Spahn. With very little advance warning, in 1953 the Braves became the first East Coast team to pull up stakes and head west, abruptly relocating the franchise to Milwaukee. Thus, Braves Field ended its existence as a major league ballpark after a relatively short lifespan of 38 years. In 1932 a new pro football team named the Boston Braves was formed, and they played, logically enough, in Braves Field. One year later they moved into Fenway Park, whose shape was more conducive to football, and changed their name to the Redskins, which was more fitting with the Red Sox. (!) Boston University acquired the Braves Field property after the Braves left town in 1953, and the pavilion on the third base side and the "jury box" in right field were soon demolished (in 1955), while temporary bleachers were installed on the north side of the gridiron. The AFL Boston Patriots played football what came to be called "Nickerson Field" from 1960 until 1962, and then -- just as the Redskins had done three decades earlier -- they moved into Fenway Park for a few years. After the main grandstand was demolished in 1968, the pavilion on the first base side and the adjacent office / ticket sales building were all that was left. 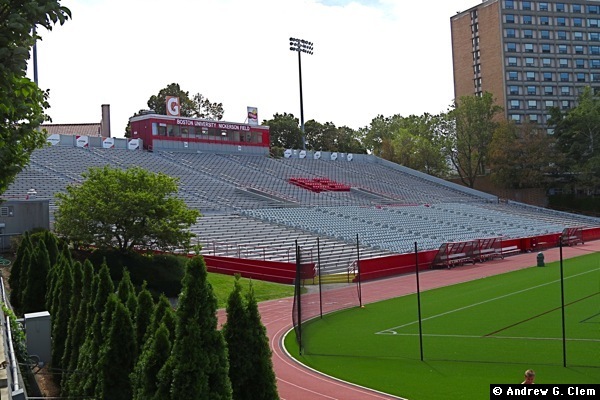 The pavilion was extended slightly on the side closest to where the infield had been, and became the main grandstand of Nickerson Field, where the Boston University football team played until 1998, when their football program was terminated. Today Nickerson Field is used for soccer matches and track meets. #1 Nickerson Field, which used to be the "pavilion" of Braves Field on the first base side. #2 Closeup view of Nickerson Field, home of the Boston University Terriers soccer team. #3 The old Braves Field office building, which is now used by campus security. #4 Braves Field historical plaque, behind the office building.